KIEC is going to organize an information session with Southern Cross University (Hotel School Sydney & Melbourne) at KIEC Dillibazar office. You will have an opportunity to meet the direct representative from Southern Cross University in the information session. You can visit our office to get face to face counseling, scholarship information, admission requirements and GTE requirements from the University representative. 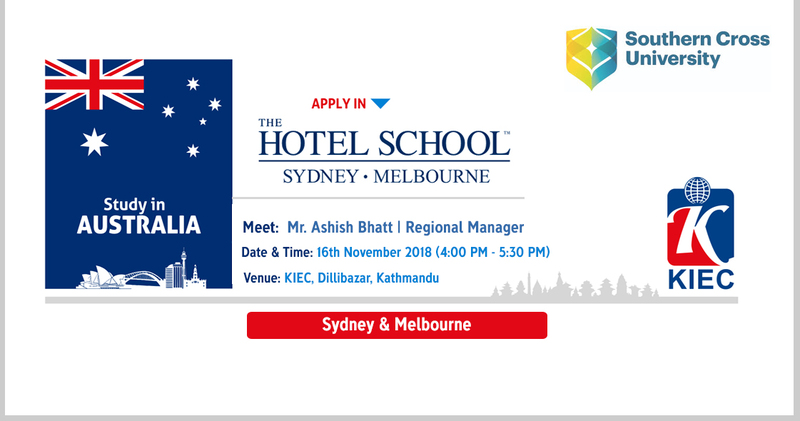 Southern Cross University (Hotel School) is offering Bachelor and Master’s degree in Hotel Management course in Sydney, Melbourne & Gold Coast.The University is located in Central Business District of Sydney and Melbourne where the student will get easy transportation and other facilities required to students. Also, the University has a very strong connection with the industry such as Mulpha Australia. It has 29 years of academic excellence where you will get the quality education with internship facility.